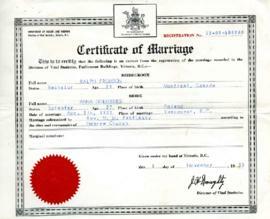 A copy of the marriage licence of William Seidelman and Esther Pearlman. They were married on August 30, 1896 in Vancouver, B.C. This certified copy was issued on October 18, 1973. 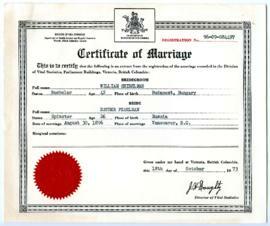 Certificate registering the Marriage of Ralph Fromson and Ann Goldberg, November 9, 1955.